Deadwood Historic Hotels are one of the most unique places to stay in the country. Nestled in the gorgeous Black Hills, historic Deadwood, South Dakota, is a fantastic place for your next vacation destination. Founded as a gold mining town in 1876, it attracted the likes of Wild Bill Hickok and Calamity Jane. Today, you will find over 350 miles of snowmobile trails, ski resorts, around-the-clock gaming, day spas, fine dining and so much more. You will definitely want to spend several days in town to enjoy everything Deadwood has to offer. Fortunately, there are many fine Deadwood Historic Hotels with accommodations available near the many attractions. Considered one of Deadwood’s historical treasures, this hotel opened in 1903 and has attracted big names such as U.S. Presidents William Howard Taft and Teddy Roosevelt and big-screen stars Kevin Costner and John Wayne. Each spacious room is complete with authentic furniture from that period of time. Uniquely-themed suites are also available. Deadwood’s only Las Vegas-style buffet is offered here at the Silverado Grand Buffet. Everyone can find what they want at this buffet that offers over 80 feet of various foods. Enjoy wood-fired pizza, salad bar, made-to-order stations, crab, prime-rib and so much more. Poker rooms, table games and slots are all available. 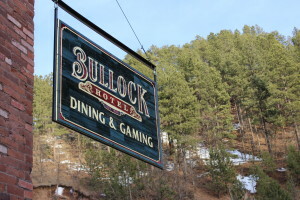 One of the oldest hotels in Deadwood SD, built by Deadwood’s first sheriff, Seth Bullock, this nostalgic hotel sits within walking distance of many downtown activities that include Adam’s Museum, Saloon #10 and the ’76 Rodeo Arena. Snowmobile packages can be purchased at the front desk or when you make your reservations. Rooms available include luxury Jacuzzi suites with king bed, deluxe room with two queen beds and classic king, queen or full bed. Amenities include complimentary wireless Internet access, free parking, refrigerator, microwave and wet bar. The onsite restaurant, Bully’s, is open each day and offers daily specials. Enjoy free wine, beer and soda while you play the slots at the on-site casino. This full-service resort will help you make the most of your vacation. Luxury rooms are available with pillow-top mattresses, high-definition cable television, refrigerator, microwave, hot tub, queen-size sofa bed, wet bar, desk, Internet, deluxe furnishings and more. Enjoy dining at the Brown Rock Sports Cafe on-site. Every meal is served each day, micro-beer is available, and each table has its own flat-screen television to help you catch up on the game. Blackjack, poker and slots are all available at the casino. Established over a 100 years ago as a gambling establishment and theater, this hotel has been beautifully restored. It is situated near several local attractions that include Spearfish Canyon National Scenic Byway, Sturgis Motorcycle Rally and Custer State Park. Gorgeous luxury suites and Victorian suites are available. Amenities include free Internet, free breakfast bar, 53″ televisions, whirlpool tubs, fireplace, marble and granite bathrooms and hot towel warmers. Enjoy free drinks while you play in the casino. Located near the Deadwood Mountain Grand Concert Hall and many other attractions, you won’t need to stray far from your hotel to find many fun things to do. Reserve a room that overlooks downtown Deadwood, and relax in the luxury of the room or suite you choose. A saloon, restaurant, gift shop, gaming room and antiques and collectibles are all available on-site. There is something for everyone at Deadwood’s only Boutique Hotel. Luxurious rooms and suites are available and feature flat-screen television, wet bar, private balcony, fireplace, Internet and more. Concerts and comedy shows are scheduled throughout the year. A restaurant and bar and lounge are available on-site. Ladies, take the day off at the full-service salon and day spa. Relax and enjoy having your nails done, a relaxing massage and special attention paid to your hair and skin. Visit the casino for table games and slots. Special activities are scheduled every day for children. Enjoy the gorgeous scenic views of the Black Hills from this hotel. All you have to do is walk out the door of the hotel to take advantage of the beautiful surroundings while you snowmobile, hike, motorcycle, ski or do some mountain biking. Shuttle service is offered to many local attractions that include Mt. Moriah Cemetery, Adams Museum and Broken Boot Gold Mine. The on-site casino offers poker, table games and slot machines. A restaurant, bar and fitness center are available to guests. An indoor water play-land is open all year and offers fun for all ages. This is a great place to bring your children. Bumper boats, go-karts, 18-hole miniature golf, arcade, train rides and a bounce house are all available to help keep your children entertained. After the children have gone to bed, it is time for you to enjoy a little on-site gambling. Available rooms include the family suite, deluxe king suite and more. Amenities include free breakfast, free Internet, indoor heated pool, hot tub, exercise room, nature area, playground and more. This hotel is located near snowmobile trails, skiing, snowshoeing, hiking, Custer State Park, Mount Rushmore National Memorial, Jewel Cave National Monument, Crazy Horse Memorial, Sturgis Motorcycle Rally and much more. The Deadwood Trolley stops right in front of the hotel to take you downtown to enjoy all the activities. Spacious rooms, a full-service restaurant, casino and lounge are all available on-site. These are just a few of the many accommodations available in Deadwood. In addition to the hotels mentioned, there are also many more hotels available from Best Western, Comfort Inn, Holiday Inn, Mariott and Super 8. Make your reservations now and get ready to start enjoying your vacation. You are sure to make some wonderful memories that will last you a lifetime. Beware The Leopard Copyright © 2019.